A French Perspective » Discover France » Top 5 Classic French dishes everyone can cook! French cuisine can, to some, sound pretentious and complicated but, in fact, French tend to cook very simply on a daily basis. Indeed, French use simple and natural basics making cooking something quick, healthy and tasty! There is no secret to their world-renowned cooking skills, the only -and main tip- is that they DO cook, and they do it every day (no matter when, where, how and who for). Ok, one thing is true, French like eating. Year after year, European independent surveys show French people spend -in average- double and even triple than the rest of their neighbors on their monthly food budget (that is for their grocery shopping excluding restaurant expenses) And no, French supermarkets are not the most expensive, the numbers come to the simple fact than French eat proper 3 course meals, at least, once a day and they mainly use good products. But let’s just use the positive part of their food obsession: their best recipes ! No need to be a chef, a skilled cook or even a food connoisseur to try to make up one of my Top classical French recipes, they are simple, easy and really tasty. These are the 5 star recipes everyone who pretends to know about French cuisine need to know ! Give it a try and impress your half for a cozy dinner, impress your guest at your new soiree (dinner party) or, simply, indulge yourself with some comfort food for an Oh la la factor! 5. 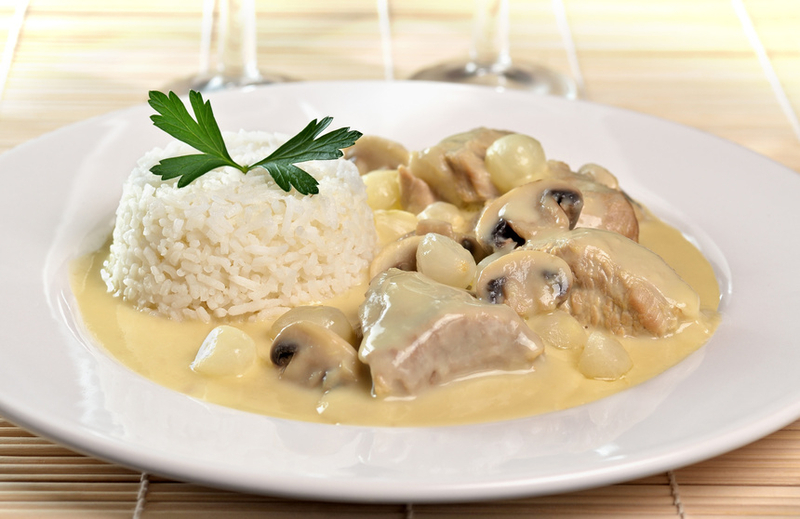 Blanquette de veau: One of the most famous and traditional complete main courses. It is a creamy yet refreshing meat dish. In France we use veal but for a cheaper alternative, you can perfectly use free-range chicken. Just follow the recipe. The blanquette de veau is typically served with plain steamed rice. 4. 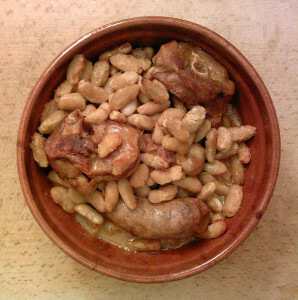 Cassoulet: This is a delicious winter dish from the South of France. Note that is a very complete and consistent dish so it is better to chose a cold day to cook it. If you cannot find confit of duck, you can perfectly remove this meat and follow with the Cassoulet recipe without. Le Cassoulet, a typical winter dish from Toulouse. 3. 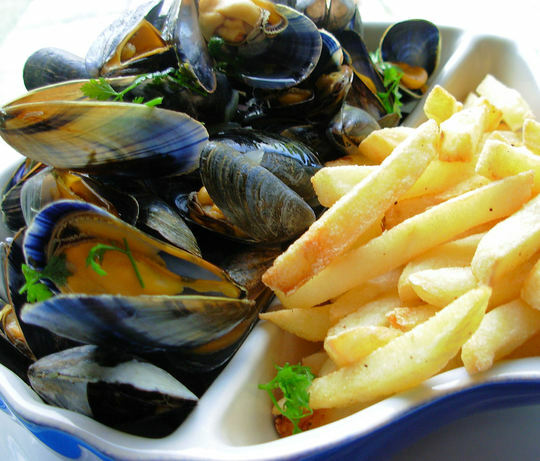 Moules marinieres – frites: The classic Bistro dish! In France we love meat dishes but this mussels combination has become one of the most-ordered quick dishes in the bistros. It is tasty, easy to do and everybody loves it! Give a little French twist to your steamed mussel’s recipe! Don’t forget to serve with French fries in a small bucket for the Oh mon Dieu result! 2. Quiche Lorraine: my favorite! A simple yet delicious recipe everybody agrees on. It is a very versatile recipe as you can replace the bacon and onions for broccoli and Stilton, mushroom etc.. Serve a part of quiche with some fresh leaves a la mode Bistro! Follow the recipe. 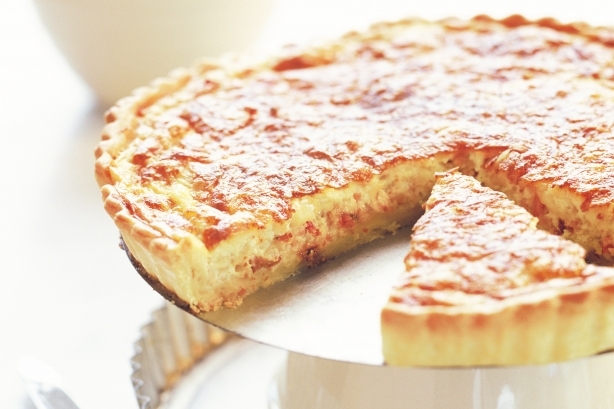 You can serve the Quiche Lorraine with Salad leave and chips, the Bistro way! 1. 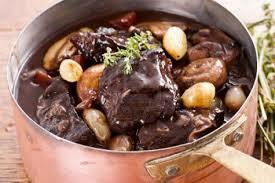 Boeuf Bourguignon: the most iconic French recipe inland and abroad. Prefect for meat lovers this is rather a winter dish made with beef, veggies and beautiful aromatic herbs! The recipe is simple but you must plane it some time in advance as it takes long to cook a la perfection! A simple rice dish is perfect but French also love their Dauphinoise potatoes. The perfect winter dish! Serve it with steamed rice, on a thick slice of bread or with pommes dauphinoises! So, no more excuses! Try to prepare these classical French dishes to start calling yourself a French cuisine connoisseur in no time! No more excuses now.. perhaps the only complicate thing about traditional cuisine are the names of the dishes! Rien de plus! Enjoy and follow me for more tips about French culture.. I can’t get it wrong, French are never wrong.. (or we say).. Tagged France, French cuisine, French tradition.